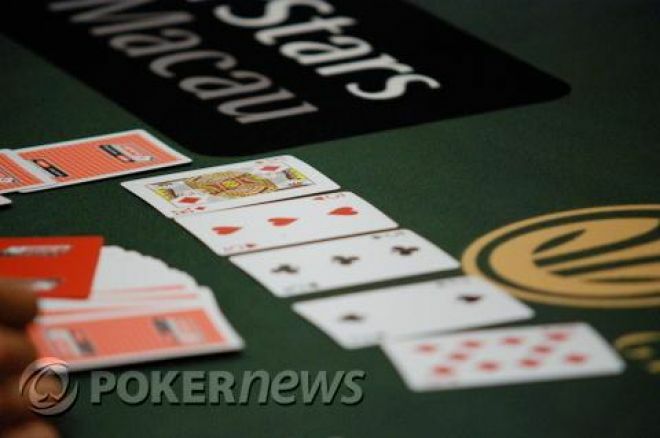 A controversial hand took place this week at the PokerStars European Poker Tour Barcelona that got me wondering: “Where do we draw the line between the actual rules of the game and the gamesmanship or unwritten rules among poker players?" First, let’s have a look at how the hand played out according to the PokerNews Live Update team. A huge crowd gathered just before the break to watch a large pot between Tobias Reinkemeier and Roland De Wolfe. The board read , with Reinkemeier calling a 95,000 bet on the river. Neither Reinkemeier nor De Wolfe wanted to show their hands, but De Wolfe eventually said, "king-high." "Well, show it then," Reinkemeier said. Highly reluctant, De Wolfe eventually flashed the and then pushed his cards toward the muck beneath the burn cards on the assumption he had lost the hand. Reinkemeier then turned over his , which missed a draw, and De Wolfe immediately went to retrieve his cards from the muck and turned over his visibly winning hand: . A ruling from tournament director Thomas Kremser was quickly called for while the crowd grew around the table as each player claimed he won the pot. De Wolfe claimed that his cards were retrievable from the muck; Reinkemeier disagreed. Kremser spoke with the dealer for a few minutes before ruling in Reinkemeier's favor while De Wolfe shook his head as the pot was awarded to Reinkemeier. Knowing the rules fairly well, I thought it best to get a second opinion from famed tournament director Matt Savage who told me: "First, I do believe the ruling was correct and Roland [De Wolfe] did need to show both of his cards to win the pot. Roland is a pro and should know this is the case and should know better. Tobias [Reinkemeier] had every right to see his [De Wolfe’s] cards first in this case, and had Roland tabled both, then he wins the pot regardless of the dealer mucking them or not." After seeing a video of the hand, Savage let me know he would have made De Wolfe’s hand live after seeing it was retrieved from the muck. Regardless of the ruling, Savage went on to say he would have had a talk with Reinkemeier, letting him know he did not want to see this type of behavior from him in the future or a penalty could be warranted. Some may say Reinkemeier was within his rights to wait for De Wolfe to show his hand, but in this situation I think it was on the verge of an angle shoot, which by definition is the hope that a player can win or save a few extra bets by performing actions that are not technically a rules violation, but which are in reality inappropriate. It's this type of behavior that bothers me. When players do their best to finagle the rules in their favor as Reinkemeier did when he waited for De Wolfe to muck and then boasted about it by showing his hand triumphantly, it should bother all poker players. Reinkemeier did not cheat in this spot; he did everything in his power to win the pot, clearly knowing the official rules. That still does not make it right, and I think Reinkemeier’s actions were against everything this gentleman’s game is supposed to be about. Of course, poker, like all games and sports, has its own set of rules, but these games and sports each also have their own sets of unwritten rules, which, as a player of the game, you are expected to follow. In baseball, it's never OK to break up a no-hitter with a bunt. Also, you never swing at a 3-0 pitch when your team has a comfortable lead. In football, every coach knows it's not OK to call for an onside kick when your team is well-ahead. In basketball, after a team has conceded defeat, it's never OK to run down the court and dunk the ball, or even take another shot for that matter. In poker, I feel that it's never OK to see that you lost a hand as Reinkemeier did and then do everything in your power to toy with the rules after the fact to win the pot. Poker players should abide by their own set of unwritten rules, one of them being: If you see that your hand has been beaten by your opponent with no action in the hand remaining, then do the right thing and allow the pot to be awarded to the player with the winning hand, regardless of the technicalities of the hand-mucking rules of the tournament. Yes, De Wolfe absolutely should have shown both cards in the first place, but when Reinkemeier finally saw that his queen-high was trumped by De Wolfe's king-high, he should have had enough honor and respect for the game to muck his own hand on the spot, allowing the pot to be awarded to De Wolfe. If, in fact De Wolfe mucked both of his hole cards without showing the king and then tried to retrieve his hand before seeing Reinkemeier's hand, then Reinkemeier, in my opinion, would have done nothing wrong. However, a king was shown, it was the best hand, and I believe the pot should have been pushed to De Wolfe. Why be "that guy" who tries to manipulate the rules in your favor? Why not “man up,” see that you are beaten and do the right thing? I understand that there will be plenty of people who disagree with me, but I believe that as long as one plays within the rules then all is fair. But we shouldn't let stereotypes of poker players being greedy, selfish people who will do any and everything to win a hand of poker be true. Such behavior does nothing but harm our game and the players who play it. I have no doubt that many poker players follow the set of unwritten rules, but this incident should be a wake-up call for some of you who don't. Poker is a game and although it is played for great sums of money, that is no reason for not following the unwritten gamesmanship rules. For up to the minute news and entertainment, follow us on Twitter and become a fan of our Facebook page.